In this new GL-12 exercise video, I reveal how to lift your way lean and strong in a quick but powerful workout progression for your biceps. I also cover key mistakes to avoid to prevent injuries as well as tips and recommendations to get the best possible results from your workout. 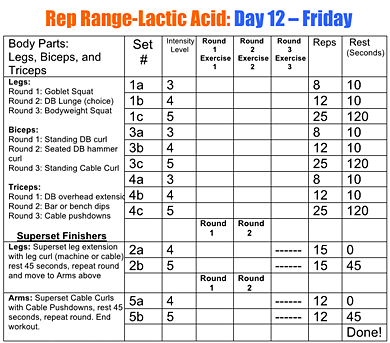 Now that we’ve taken care of leg day, I’m going to show you how to add serious definition to your arms as we take our rep-range lactic acid workouts to the biceps and triceps. Remember, there’s a reason I strategically designed legs and arms in the same workout together to help you with more fat loss and to help you get that lean, toned, Hollywood look. Leg day kicked those fat-burning hormones into overdrive, so as we move on to your biceps and triceps after your legs are done being trained, your arms will now have more of a chance to develop, tone, and grow because you’ve stimulated the hormones ahead of time with your leg workout. Check out the Get Lean in 12 team in action in the video above as I walk you through several different exercises for your biceps and triceps, including dumbbell standard biceps curls and hammer curls, dumbbell overhead extensions for your triceps, cable curls for your biceps, bar / bench dips, and cable pushdowns for your triceps. Is the “Over 40” book your product or is it something else?